A trade card in the Lewis Walpole collection for Richard shows an olive tree which has been regarded as the Sterry shop sign (see here). The card already says that the shop was opposite St. George’s church, so although no house number is given, it probably was at number 156. Father Benjamin and son Richard were both buried in the Friends’ Burial Ground at Long Lane, Southwark, true to their Quaker beliefs. Richard’s son Anthony (1759-1826) was the next to continue the business and from him we have two documents telling us more. 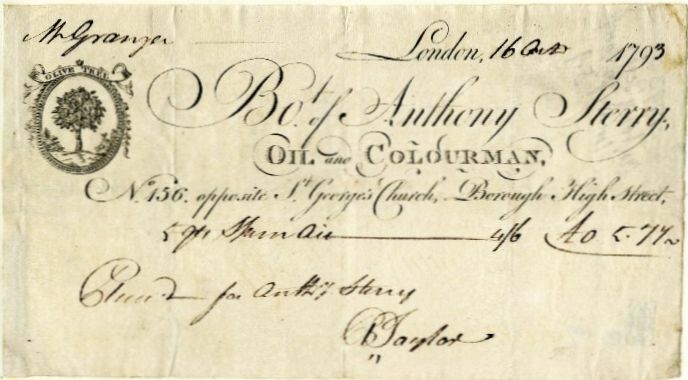 The first one is a receipt for a Mr. Granger who bought some oil in 1793, on which Sterry describes himself as oil and colourman. The receipt definitely places Sterry at 156 Borough High Street, opposite the church of St. George the Martyr, and, judging by the trade mark on the receipt, the shop sign was indeed ‘the olive tree’. A second document lists some of the goods Anthony had for sale in the shop. 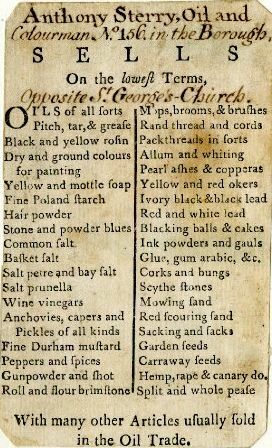 Not only oil, either for cooking, greasing or painting, but sand, soap, salt, and starch were among the useful articles that could be bought in Sterry’s shop, not to mention other groceries, such as caraway seeds, vinegar, pickles and dry peas. And if you were in need of mops, brooms, hemp, or gunpowder, Sterry was your man. Anthony died in 1826, a bachelor, and was also buried at Long Lane. He received a memorial in the Annual Monitor (1827) in which it is said that he had a pleasant personality and that he had devoted a lot of time to “objects of public benevolence”. He suffered from gout and a few weeks before his death he had “a paralytic seizure, which shook his enfeebled frame”. But just as he was recovering, he had a second seizure and died two days later. In his will he described himself as “late of the High Street, but now of Newington Butts”, suggesting he had already retired from the business. (2) He left various bequests to his brother Joseph, his nephews Joseph junior and Henry, and to lots of cousins and (former) servants, as well as to the Quaker Monthly Meeting. His brother Joseph (1777-1857) and nephew Joseph junior (1800-1875) are next mentioned in the Surrey tax records for the premises as Sterry & Son. By 1831 that has changed to Sterry & Sons, as younger son Henry (1803-1869) also joined the business. 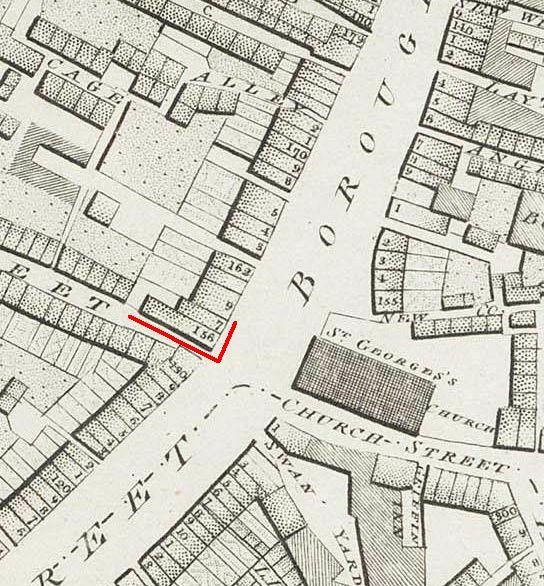 In 1837, they insure 156 and 157 Borough High Street and 1, 2 and 3 Mint Street. Number 156 was situated on the corner of Mint Street, so it is not illogical that they acquired the neighbouring properties around the corner, although they may have rented out some of their space, as in the 1848 and 1851 Post Office Directories, 2 and 3 Mint Street are occupied by John Askew. 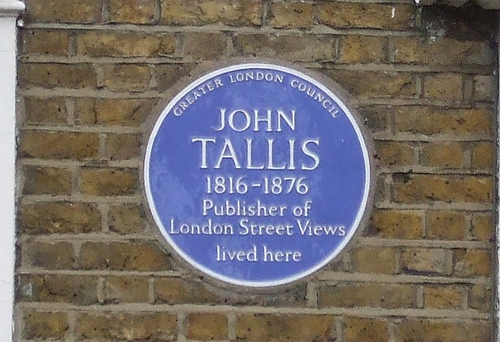 157 High Street, by the way, is not mentioned by Tallis. The next door neighbours are at number 158, although Horwood in his 1799 map still shows 156 and 157 as separate buildings. Tallis describes the shop as an Italian warehouse, which, in those days, meant a grocery shop that also sold some ‘foreign’ wares, such as dried pasta, dried fruits, and possibly tins of anchovies and such like, but the Sterrys also continued the sale of ‘ordinary’ goods, such as salt, soap and various kinds of oil. 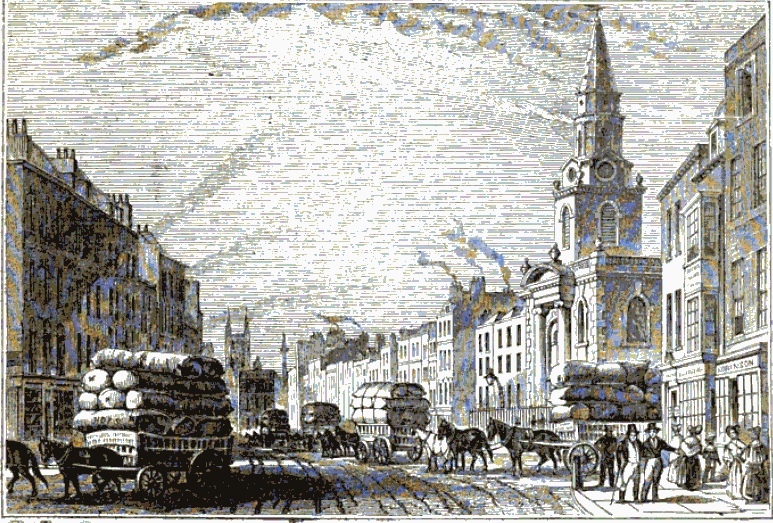 In February 1857, Richard, Henry, Joseph, and Alfred Sterry dissolve the partnership they had as Sterry, Sterry, and Co. at 23 Cannon Street and as Joseph Sterry and Sons at 156 High Street. (6) If I understand all this correctly, then the partnership that was dissolved in 1845 was due to Joseph senior’s retirement (in the 1851 census he is listed as ‘retired oilman’), and the 1857 split was a result of Alfred dropping out, although the death of Joseph senior earlier that year, may also have had something to do with it. (7) In late 1858, the partnership between the three remaining Sterrys is dissolved. (8) The Cannon Street address seems to have been a replacement for 143 High Street. Number 143, by the way, does not exist in the Tallis Street View; between numbers 143 and 144 is Layton’s Buildings which was the address for Richard and Alfred, second cousins of Joseph junior and Henry (Richard and Alfred’s grandfather Benjamin was the brother of Joseph and Henry’s grandfather Richard), as it had been at least since 1823 when their father Richard is mentioned at that address as wholesale oilman in Kent’s Directory. You can just see the letters ‘LAY’ of Layton in the top right-hand corner of Horwood’s map above between numbers 142 and 144. Henry Sterry died in 1869 and the 156 High Street and 23 Cannon Street addresses are given as former addresses in his probate entry. (9) Joseph died in 1875 and is only described as of Peckham Rye Common with his two sons as gentlemen of the same address. (10) Joseph Ashby Sterry, the son of Henry, also left the grocery business and became a journalist and writer. But that does not mean the Sterrys disappeared altogether from the High Street. The 1873 Post Office Directory has a firm still called Joseph Sterry & Sons, although the original Joseph and Sons were no longer in charge, as manufacturers of poor man’s plaisters and German paste at 2 Mint Street, and in the 1892 Post Office London Directory they are found at 2 Marshalsea Road, but that is just a name change for Mint Street. 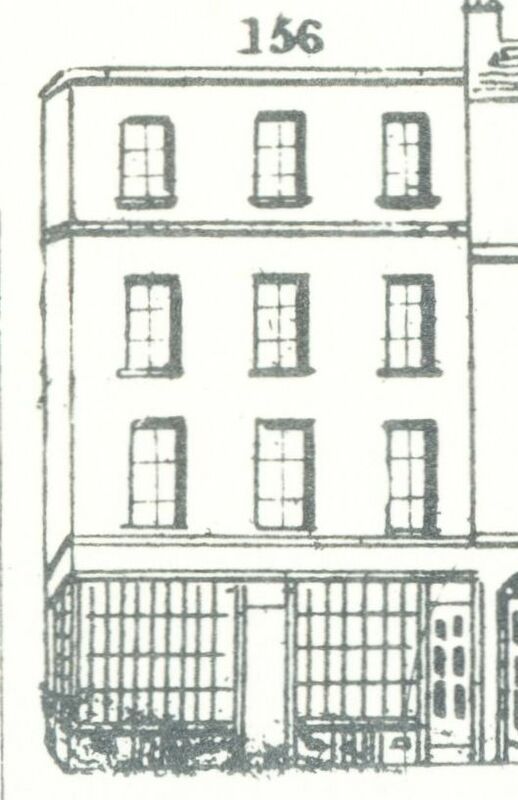 Below are two pictures of the Sterry shop: the first one is from The Penny Magazine of 14 October 1837 and (just) shows the Sterry premises on the extreme left-hand side. The second picture is from 1826 and by William Knox. In that painting, the Sterry shop is the second on the left, next to Sheppard’s wine and spirit vaults. Knox depicted Mint Street (between Sheppard’s and Sterry’s) a lot narrower than it in fact was, but let’s call that artistic licence. Nothing is now left of the corner shop. Where once Suffolk Place, the grand Tudor town house of Charles Brandon, the Duke of Suffolk, stood, and where the Sterrys had their business for more than a century, a modern Brandon House was built in the 1970s. And even that has now been demolished to make way for yet another property developer’s scheme. More, lots more, on the Sterry family can be found here. (1) The Diary of Thomas Turner 1754-1765, ed. David Vaisey (1984). (2) Library of the Society of Friends, TEMP MSS 59/8/1-108. Thanks go to Tabitha Driver for sorting this out for me. In 1799, Joseph senior had married Ann Hicks of Bardfield/Saling, Essex; she died in 1811 and Joseph remarried in 1813 to Deborah Heming. (4) The London Gazette, 1 August 1845. (5) The Daily News, 14 May 1851. (6) The London Gazette, 17 February 1857. (7) He died 1 January and was buried 8 January at Hertford. PROB 11/2253/138. (8) The London Gazette, 4 January 1859. (9) England & Wales, National Probate Calendar (Index of Wills and Administrations), 1869. Estate valued at under £30,000. (10) England & Wales, National Probate Calendar (Index of Wills and Administrations), 1875. Estate valued at under £30,000.